Windows 7 has already been RTM’d and is now officially available to Connect, MSDN and TechNet Plus subscribers. 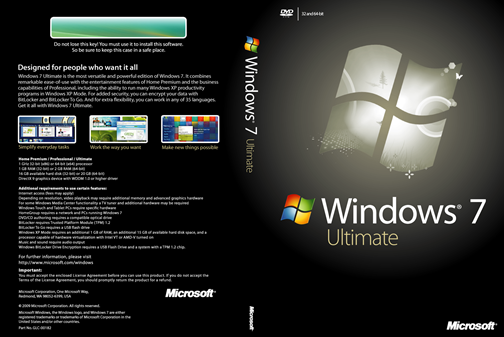 For those of you who are downloading the original bits from either MSDN or TechNet can use this Box Art DVD Cover to package your personalized copy in your very own Windows 7 Ultimate Box. This is the actual image from the original Box Art with 150 dpi (1613×1080 resolution) which will feature on retail packages of Windows 7 Ultimate SKU. Windows 7 is scheduled for general availability on October 22nd, 2009. Wow… the DVD covers are really cool! Awesome Share! dudes this aint the real cover! give some proof it is! all the info comes from here: http://www.microsoft.com/windows/windows-7/compare-editions/ultimate.aspx. noone has the real cover yet. Awesome cover !!! best one i have every seen for windows 7 ultimate. Can you please do home and proffessional too ? I wish there was a dvd cover to go with this.